Folding plate ‘Delineation of the New Improved Saccharometer’ to the rear. Perhaps the most well known historical Scottish brewing firm was that of William Black & Company of Aberdeen believed to have been established in 1803, and his ‘Devanha Brewery’ used the former Paper Mills by the Wellington Suspension Bridge in Aberdeen. Black’s Devanha Porter - a dark beer resembling stout - became famous throughout the UK, the Brewery being conveniently close to the railway halt at the Cattle Bank. The firm itself was laterally acquired in 1819 to become the Gilcomston Brewery and again by the Devanha Brewery Company Limited, registered as a limited liability company in 1910. Brewing finally ceased in 1930 after the firm was acquired by Thomas Usher & Son Ltd. of Edinburgh. William Black & Co. also ran the Devanha Distillery, built about a mile upstream from the Brewery in 1825. [Durden Park Beer Circle / The Doric Columns]. A rare and delightful guide to the benefits of the chafing-dish, with numerous recipes for eggs and omelettes, caramels, corned beef, lobster, macaroni, oysters, turkey, veal and sweetbreads. ‘There are all possibilities within the chafing dish, providing there is a cordon blue, who gives herself up to the task of managing it. 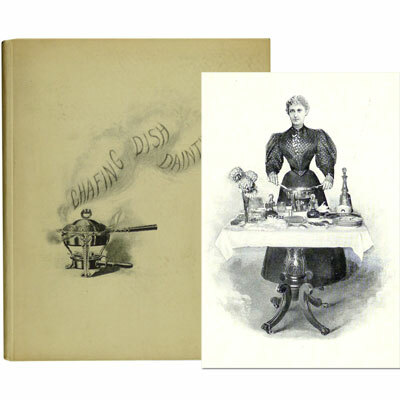 If the cook be a novice, Mrs. Sarah Brownson How of Brooklyn in her pretty book “Chafing Dish Dainties” will explain all the niceties and there is also to be found an extensive menu, all to be cooked with a chafing dish.’ - New York Times, New Book Review, 1897. Mrs. Sarah Brownson How, a New York socialite gave frequent lectures on the art of housewifery as well as the history of New York. 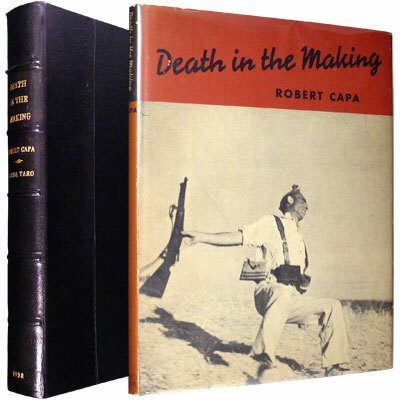 A stunning copy of Robert Capa’s first published monograph – a landmark of 20th century war photography – in the rare dust jacket depicting a Loyalist soldier falling to his death, gun in hand, after being shot – a now iconic image of the Spanish Civil War Featuring 145 photographs by Robert Capa and Gerda Taro, captions by Robert Capa, translated and with a preface by Jay Allen, and arranged by André Kertesz. Housed in a custom clamshell case of fine black morocco leather over matching cloth, velvet lined, and lettered in gilt to the spine. A rare and signed first edition of ‘the most pivotal book in brewing’. With a commendatory preface written by his friend Peter Shaw, physician to the king and experimental scientist with an interest in chemistry. 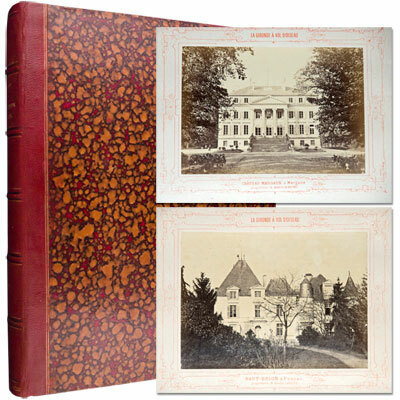 A rare and remarkable work on Bordeaux, in beautiful condition, two volumes bond in one, containing fifty-five early photographs of the great Châteaux of Bordeaux, with their history, vintages and other contributions, in French. Of superb quality, the plates of the Châteaux include Lafite, Latour, Mouton, all accompanied by a history and contemporary description of the Châteaux and wine vintages. With a long and interesting commentary on the classifications of first and second Crû, strongly in favour of reclassifying to Premier Cru, Branne-Mouton (purchased and renamed Mouton-Rothschild in 1853 by Baron Rothschild but herein referred to by it’s former name), for which they would have to wait a further century until 1973, and referring to both the 1855 Exposition Universelle de Paris, and London’s Great Exhibition in 1851. There are additional chapters on ‘La Système Féodal Appliqué Aux Vins du Médoc’ and ‘Les Grand Vins de Saint-Émilion’. A truly important and visually imposing work on Bordeaux and a vital part of any wine book or photographic collection. Freda De Knight's classic collection of African-American recipes, with her warm inscription, 'Yours for good eating - Freda C De Knight'. Scarce in such fine condition combined with the inscription. With a foreword by Gertrude Blair, and cartoon-style drawings by S. Lodico. 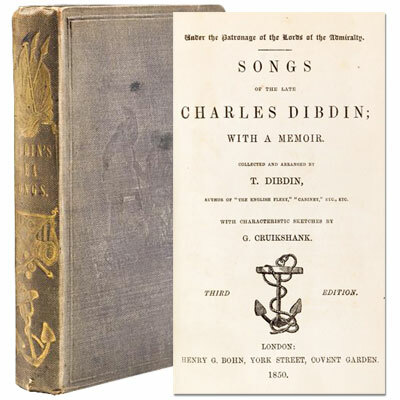 A melodious collection of patriotic sea songs, composed by British writer and dramatist, Charles Dibdin, who according to The Spectator in 1863 is considered to be ‘the only man who ever wrote sea songs that accurately delineate the sailor’s peculiarities of disposition’. 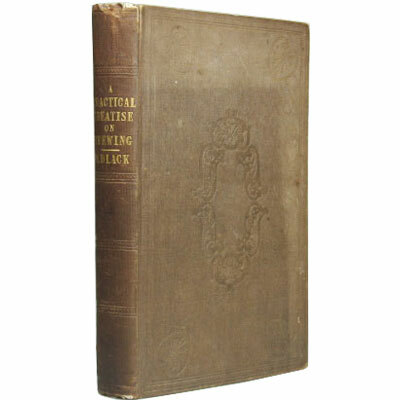 Delightfully illustrated with several full page engravings, including frontispiece, by George Cruikshank, and featuring a memoir of Charles Dibdin, Addenda by Thomas Dibdin, Songs from the Works of the Charles Dibdin the younger, and a list of subscribers. 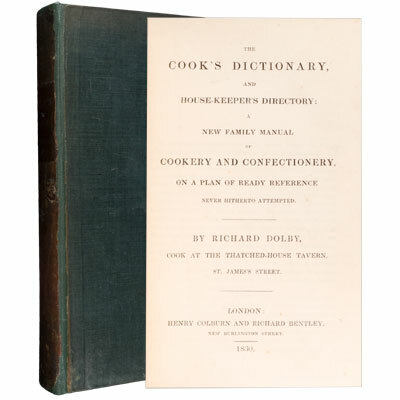 An uncommon copy of the first edition of The Cook’s Dictionary, considered the first cookery book to be arranged alphabetically. This wonderful compendium of delicacies – compiled by 19th century chef Richard Dolby of the Thatched-House Tavern on St. James Street and a popular domestic reference of its time – contains several thousand entries and many recipes for cooking, baking, and brewing that had never before appeared in print. Features a glossary of cooking terms, and a number of alphabetical tables listing fish, crustaceans, fowl, fruit and vegetables, and when they are in season.